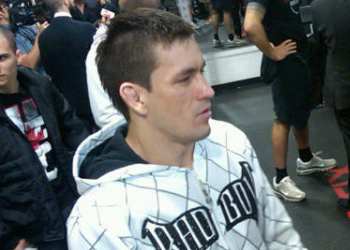 The UFC wasted no time in finding a replacement to face Demian Maia on January 28th. Hours after promoting Michael Bisping to the co-main event at “UFC on FOX,” company president Dana White announced undefeated Chris Weidman has agreed to serve as a last-minute substitute to fight Maia. Maia and Bisping were scheduled to be the third scrap airing live during the Octagon’s return to primetime, but an abrupt injury to Mark Munoz forced a reshuffling of the middleweight deck. Bisping now take Munoz’s spot against Chael Sonnen. The victor advances to a championship affair against reigning king Anderson Silva. Weidman is perfect through his first seven professional contests. He was last seen submitting Tom Lawlor at UFC 139 in November. Maia has posted a 3-1 record since losing to Silva in early 2010. The submission specialist’s lone blemish during his current run came at the hands of Munoz. He most recently beat Jorge Santiago at UFC 136 in October. The United Center in Chicago, Illinois hosts the festivities. Light heavyweights Phil Davis and Rashad Evans will headline the show.